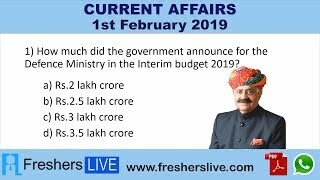 Current Affairs 1st February 2019: Instantly obtain Latest Current Affairs 1st February 2019 with all essential info, Be the first to know all the Current affairs 1st February 2019 top news, Major Issues, Current happenings, Important events in National as well as International level with clear explanation. For all competitive exams and Interviews, equip yourself with the Latest Current Affairs 1st February 2019 granted here. The Telecom Regulatory Authority of India (TRAI) said that more than 170 million digital TV customers in India would not face any service disruption on account of the introduction of the new tariff regime in broadcasting from February 1, 2019. About 62% of the over 100 million cable TV consumers and 30% of the over 70 million DTH subscribers had registered their channel choices under the new tariff guideline. Italian Prime Minister Giuseppe Conte along with UN representative launched Africa Centre for Climate and Sustainable development. The new center is located near the Food and Agriculture Organization headquarters in Rome. The major objective is boosting the agricultural sectors and promoting rural development in Africa. Scientists developed an artificial pancreas smartphone app that will help to analyze blood sugar levels in diabetes patients. This application is formed with the capacity to connect with glucose monitors, insulin pump devices, and decision-making algorithms. Lt Gen Rajeev Chopra took charge as the Director General of NCC (DGNCC) in New Delhi. He has been awarded Ati Vishisht Seva Medal for his distinguished service in January 2018. Punit Goenka, Managing director and CEO, Zee Entertainment Enterprises Ltd re-elected the new chairman of TV viewership measurement company, BARC India. He was the founder of BARC India. Punjab govt gave approval for ‘Smart Village Campaign’ worth of Rs 385 crores Punjab government approved a rural development scheme”‘Smart Village Campaign” worth Rs 384.40 crore to build village infrastructure and provide essential amenities. Getting approved by Chief Minister Amarinder Singh, Reformation and implementation of the scheme would be financed with funds from the 14th Financial Commission and MGNREGA.